EMSI recently developed a methodology for calculating expected wages for occupations by region. The analysis is aimed at helping us better understand what regional earnings should be given the performance of a set of standardized occupations that are ubiquitous, stable, and diverse across the US economy. It’s a bit like the consumer price index, just for occupations. To illustrate how enlightening this can be, we produced a high-level summary for architecture and engineering occupations (SOC 17) to see what cities rank above and below where you might expect. In this case, we limited our analysis to metros with greater than 190,000 jobs. Also note, we are using 2011 wages in this model, and most of the occupations in the group are related to engineering. The top six MSAs on our list are the cities (190,000+ jobs) with the highest actual-to-expected ratios in that nation. They are therefore good regions for jobseekers and employees because of the higher-than-expected wages. Also notice how these are cities you might not expect (e.g., San Francisco and Seattle aren’t on the list). Why? Well, the wages in those cities are good, but there is more competition (in the form of talent), the cost of living is quite high, and the other occupations in the region are also pretty high-paying. The regions we have listed here have architecture and engineering jobs that are paid substantially higher than what we would predict given the local economy. Right off the bat, the model gives us some data that we might not have expected. The Augusta-Richmond MSA, which is spread between the Georgia-South Carolina border, has the highest actual-to-expected ratio (1.15). Based upon our analysis of a set of standardized occupations, we expect that architecture and engineering occupations would make $34.29 per hour (average earnings for all occupations in this category) in this MSA. In reality, wages are just about $5.00 per hour more ($39.36), which is significant. This means that the Augusta-Richmond MSA has the highest national earnings for architecture and engineering given the conditions in the local economy. This also makes Augusta-Richmond the second-highest paying region for these jobs among cities where wages are higher than we would expect. This MSA also has the highest percent job growth since 2009, which might be a prime factor contributing to the higher-than-expected wages. High local demand means that companies have to pay more to get the workers they want. This region also has a concentration of architecture and engineering workers above the national average. Oddly enough, the labor market in this area has actually declined by 1% since 2009, which equals a loss of more than 3,000 jobs. Sectors like construction and education are still not doing very well. So what companies might we be talking about in Augusta-Richmond? After all, if you are considering a job as an engineer or architect, this seems like a good region to focus on. We searched through Equifax data, which is now part of our tools, and found that URS has a strong presence in the region. If you are not familiar, URS is on the list of top 500 largest companies in America. CH2M Hill, Ingersoll Rand, and John Deere also employ engineers in this area. With an actual-to-expected ratio of 1.14, Knoxville is No. 2 on the list. Actual wages ($37.35 per hour) are $4.69 more than we would expect and, like Augusta-Richmond, we see good job growth since 2009. Also note that there are 2,000 more jobs in this region than Augusta-Richmond. In general, Knoxville’s economy is healthier than the top city in our list. Since 2009, the region has expanded by 4%, adding some 14,000 new jobs. A high demand for engineers in the region is also likely driving the wages up to levels higher than we would expect. A big factor here is Oak Ridge National Laboratory. URS also has a presence in Knoxville, as does Navarro Research, a big government contracting firm, and ABSG Consulting, a company that designs products and services for risk management. Obviously, people who focus on engineering and architecture would have many other employment opportunities with different types of companies, but these are just good examples of groups that employ engineers. The third city with better-than-expected wages for architecture and engineering occupations is Oklahoma City. Wages are $4.50 above where we would expect and job growth is strong (more than 10% since 2009). Also, with nearly 14,000 current jobs, OKC is a good spot for engineers to be looking. OKC is also demonstrating very healthy growth. Architecture and engineering gained 1,300 new jobs since 2009 and the overall economy grew by over 14,000 jobs. This is even better than our previous two cities. With companies like Interim Solutions for Government, OKC is a big city for government contracting. Firms like Northrop Grumman, CH2M Hill, Chesapeake Energy, Wyle, and Boeing also have a strong presence there. Unlike our previous three cities, Baton Rogue has experienced overall decline since 2009. Despite this, the actual-to-expected ratio is quite high (1.13) and wages are $4.32 per hour higher than we would expect. A more stagnant economy combined with a dip in total employment should result in a drop in wages in the coming years. It should also be noted that the region has more than 9,000 jobs in this sector and a relatively high concentration (when compared to the state and nation) for architecture and engineering jobs. However, the regional concentration is slipping more toward the national average and away from specialization. Basic summary: Wages are still pretty high, but the job market isn’t as good as Knoxville or Augusta-Richmond. Jacobs Engineering, Richard Design Services, and Stebbins Engineering have a presence in this region. Huntsville, which is fifth on our list, is the highest-paying metro region on the list. Despite that good news, architecture and engineering jobs have contracted by a surprising 8% since 2009, making it the second-worst city in terms of decline on this list. The regional labor market in general has contracted by 2% in that same period. The only occupation category to lose more jobs than architecture and engineering is production. Pretty much every engineering occupation — from aerospace, which is the largest engineering sector, to mechanical — lost jobs. As it stands, hourly wages for architecture and engineering occupations are still $5.00 higher than we would predict and even $5.00 higher than a place like the New York City MSA. So, if you can find an architecture or engineering job here, it’s likely going to be well-paying for the economy. Again, wages are high, but the labor market is pretty shaky. Huntsville is pretty well known for aerospace and defense (companies like Northrop Grumman, Raytheon and Lockheed Martin) and the Cummings Research Park. Ogden, Utah, is ranked sixth for cities where actual architecture and engineering wages are higher than expected and is the only non-Southern city in the top six. Current pay stands at $36.48 per hour, which is $4.00 greater than we would expect ($32.54). Ogden is also the smallest city in our top six. Despite its size, architecture and engineering jobs play a big role in the regional economy. We can say this because, next to military occupations, architecture and engineering jobs have the second-highest concentration in Ogden relative to the national average. Since 2009, there really hasn’t been any job growth, however. And the local economy has only increased by 2%, so it might be a tough area to find a job right now. As far as employers go, the Air Force has a strong presence as well as Northrop Grumman, General Dynamics, and General Atomics. So now we reverse the perspective a bit. In our previous analysis, we looked at the top six cities where architecture and engineering occupations make more than we would expect. Now we will look at the top six (or bottom six, depending on how you want to think about it) cities where pay for architecture and engineering is below what you would expect. These might be good targets for employers who are looking for lower-wage areas. Expected wages for architecture and engineering occupations in Milwaukee are $36.69 per hour. In reality, the average is more like $32.81, which is $3.88 below what we would expect. There also hasn’t been much job growth (in percent terms) for either engineering or the general economy. There are 16,000 jobs in the region, and if you are employer looking to hire or relocate, Milwaukee might be a good target. Wages are a bit lower than we would expect, so workers might move jobs for slightly higher offers, and there is a fairly large pool of workers. Milwaukee is the second largest city on this list. In terms of employment, Siemens and Johnson Controls have a presence in the region. Architecture and engineering jobs in Columbus have contracted by 3% while the rest of the economy has actually increased by 3.4%. Actual hourly wages ($32.26) are similar to Milwaukee and are $4.00 below what we would expect. The basic story: Columbus appears to have a rapidly decreasing share of engineering jobs. In three short years, the region’s location quotient — a measure of concentration — for architecture and engineering jobs dropped from .93 to .85 (1.0 is the national average). So what is driving this region’s growth? The healthy sectors appear to be health care and computer-related jobs. If you’re an engineer looking for work in Columbus or you’re thinking of setting up a shop there, note that the region seems to be de-specializing in the architecture and engineering occupation sector. One notable engineering group in the Columbus area is the Honda R&D group. Again, if you are an employer looking for underpaid engineers, Columbus could be a good target. The expansive New York City MSA, which covers half of New Jersey, is third on our list of metros where wages are below what we would expect. The NYC MSA has 92,500 architecture and engineering jobs, with average pay about $5.00 per hour below what we would expect given the economy. There hasn’t been job growth either. Since 2009, architecture and engineering jobs have contracted by 1% in an economy that grew by 2%. Another important statistic: The NYC MSA is pretty far below the national average when it comes to the concentration of engineering jobs. This means that even though the region has nearly 100,000 jobs, it is actually below what we would expect for a region of its size. Finally, the NYC MSA has the highest expected wage (nearly $45 per hour) on our list, which isn’t surprising (note: Huntsville’s actual wage is in this range). In reality, the actual wage for the NYC metro area is much closer to what is seen in metros like Augusta-Richmond or Oklahoma City. The number of well-known companies in this region are more numerous than we can include. For now, here are three to consider: Foster Wheeler, Hazen and Sawyer, and Syska Hennessy. Next we jump from the largest city to the smallest in terms of architecture and engineering employment. The economy of Lakeland-Winter Haven has about 210,000 jobs total and only 1,900 jobs related to architecture and engineering. In addition, since 2009, the economy has increased by 1% while architecture and engineering jobs have contracted by 9%. This means that the metro area, which has a very low concentration of engineering jobs, is quickly losing the architecture and engineering base it has. Not surprisingly, wages are $3.50 per hour below what we would expect. Furthermore, the average wage for architects and engineers in Lakeland-Winter Haven is the lowest on our list. Wages in Hunstville are a whopping $17.71 greater than Lakeland-Winter Haven. If you are an employer looking for underpaid engineers, this region is a good target. Lockheed Martin, DCR Services, and AMEC have a presence in the region. When it comes to cities with actual-to-expected wages lower than we would expect, Trenton, N.J., is second-to-last on the list. Actual wages are $38.61 per hour, which is $5.19 below the expected level of $43.80. There are 4,000 architecture and engineering jobs in this economy, which, given its total workforce of 247,000, means it has a architecture and engineering workforce similar to the national average for its size. This is another region where the economy has had 1% growth, but fairly significant decline (-5%) in architecture and engineering occupations since 2009. If you are an employer looking for engineers who might be a bit footloose, the Trenton area could be worth checking out. RMJM, URS, and Raytheon are located in this region. So now we reach the bottom. The city with the lowest actual-to-expected ratio (.85) in the nation for engineering and architecture jobs is Fayetteville-Springdale-Rogers, a MSA in northwest Arkansas and southwest Missouri. This region has the unique distinction of having architecture and engineering wages that are nearly $6.00 per hour below what we would expect for the economy. Fayetteville is also about $12 an hour below places like Oklahoma City, Augusta-Richmond, and New York City — and $17 below Huntsville. Furthermore, this metro has the second-fewest jobs on our list. As of 2012, there are about 223,000 jobs in the economy and just 2,475 are related to architecture and engineering. This means that the Fayetteville area has a concentration very similar to Lakeland-Winter Haven and the New York MSA — far below the national average. Oddly enough, this is also the only region with an actual-to-expected ratio below 1.0 that had some growth (a modest 1.2%). The rest of the regional economy grew by 5% since 2009, making it the fastest-growing region for our lower-cost cities. Wages should jump a bit if these trends continue. Again, this would be a good region for employers to target workers because of the relatively low wages. Some of the top regional employers are Walmart, the Benchmark Group, Cisco, and Oracle. So, if you’re curious, here is a look at architecture and engineering occupations. Most of them are engineering jobs that have grown at a rate consistent with the national economy (2% growth since 2009). Drafters and architects have taken the biggest hit nationally. Surveyors and surveying/mapping tech haven’t fared too well either. Otherwise, engineers are doing pretty well. Biomedical engineers have grown by 21% and petroleum engineers have grown by 17% since 2009. If you are interested in finding a good spot to be an engineer, we suggest taking a look at the Augusta-Richmond area, the metro region with the highest actual-to-expected ratio in the nation. 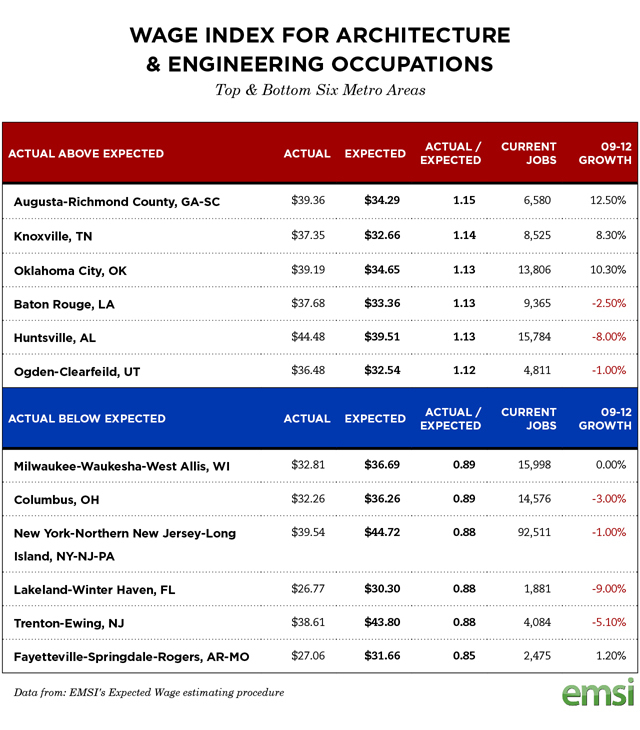 Architecture and engineering occupations in Augusta-Georgia make nearly $40 per hour, which is the third highest on this list and on par with the wages seen in the NYC MSA. To put that in perspective, if you want to work as an engineer in the NYC MSA and live in a place like Long Island, where the average home price is $815,000, the dollar isn’t going to stretch quite as far as it would in a place like Augusta, Ga., where the average home price is $163,000. Other top cities to consider based on the actual-to-expected ratio are Knoxville and Oklahoma City. Both have strong labor markets, a decent amount of jobs, and wages quite a bit above what we would expect. In general, cities in the South seem to be pretty competitive for architecture and engineering wages. Ogden was our only non-Southern city to have wages higher than we would expect. This could indicate that there is more of a scarcity of good talent in these regions, which should drive the price up. Baton Rouge and Huntsville have shakier labor markets, but the pay tends to be good if you have a job there. Cities that tend to demonstrate underpay for engineering are spread about a bit more. Two are in the New York/New Jersey area (NYC MSA and Trenton MSA), two are more Southern (Lakeland-Winter Haven and the Fayetteville-Springdale-Rogers MSA), and two are in the Rust Belt (Columbus and Milwaukee). This could be due to labor markets that are more unstable and therefore slightly saturated with engineers. Finally, if employers are complaining about skills shortage in cities where the actual pay is far below the expected, chances are they are not willing to pay enough. To put it in perspective: If you are an employer in Milwaukee that is looking for engineers and are only willing to pay $32 per hour, you will likely find a limited pool of candidates. This might prompt you think there’s a skills shortage. Before you jump to that conclusion, try raising the hourly wage to $36 or higher and you will likely see a lot more interested engineers flocking in your direction. Data and analysis from this report came from Analyst, EMSI’s web-based labor market tool. Please contact Rob Sentz (rob@economicmodeling.com) if you have questions or comments. Follow us @desktopecon. Read more about our wage estimating process here. Submitted by della121314 on Sat, 07/13/2013 - 06:41. Submitted by Adam963 on Thu, 12/27/2012 - 03:41. Submitted by assiasalikhowa158 on Wed, 01/23/2013 - 00:58.
an unhealthy economy is one in which there is not enough money circulating. A healthy economy is like a lake with a river running through it; the river keeps things fresh and active. When the river dries up, the water in the lake is no longer circulating and it grows stagnant. The plants and fish eventually die and the water gets worse. This is like an unhealthy economy. Submitted by aikenalan68 on Fri, 01/04/2013 - 16:21. Submitted by lisaibin on Mon, 12/17/2012 - 10:25. These games for boys also educate them various methods of dribbling the ball. Because they are timed, this is another feature that tends to make them appealing. Submitted by bartholomewbarry87 on Wed, 12/26/2012 - 15:09. There are several aspects of economics and a lot has been written and talked about economics but one common question that always rise in minds of people includes the fact that why do we need to study economics. Submitted by sarinakane34 on Mon, 12/17/2012 - 23:08. Submitted by aldisaldrich39 on Fri, 12/21/2012 - 03:11. Submitted by babygames8 on Mon, 12/17/2012 - 05:09. Dora is so cutie and make you want to touch her head and make her happy,now you have the chance to play dora games to dress this lovely girl up and make her much pretty then.Also if you don’t know how to take care your baby as a young mother, you can play baby games online,too! Submitted by babygames8 on Mon, 12/17/2012 - 05:08. Sweet little girls are always passionate about Barbie's,who said that those barbie dress up Games are for youngsters only? These free dress up Games are really addictive, everyone enjoys a good round of taking part in these games.